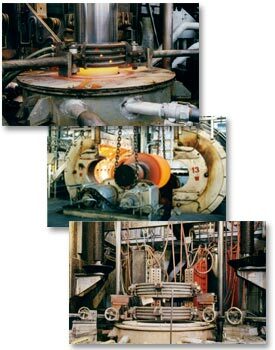 Hardening methods include differential, classical, or dual frequency progressive induction chosen for the specific customer requirement. Quenching methods include water, air mist, forced air and sub-zero cryogenic in liquid nitrogen for maximum reduction of retained austenite. Five dual coil progressive induction hardening units with ultra low frequency allow for 60/60, 60/6000, 600/1200, or 600 cycle with capacity to 1020 mm diameter x 7620 mm overall length. Three selas gas fired furnaces with capacity to 1625 mm diameter handle either work roll or back up roll hardening requirements. Six quenching stations providing radical water, air, mist, and forced air. Two cryogenic units are capable of –120° C.